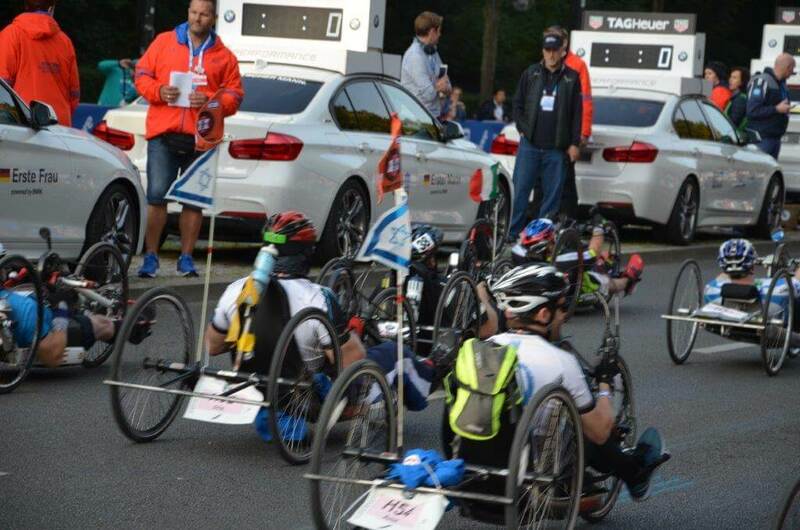 A delegation of 20 Zahal Disabled Veterans took part in last week’s Berlin Marathon, one of the five largest marathons in the world. The ZDVO delegation was made up of 8 runners, members of the Beit Halochem Jerusalem Running Team, 5 hand cyclists from Tel Aviv’s Beit Halochem and 6 hand cyclists members of Haifa’s Beit Halochem, amongst them those who train regularly with the riding clubs set up by Haifa’s Beit Halochem in the Western and Upper Galilee for the benefit of members residing in the periphery. All along the 42 km. route, the riders and runners were cheered and saluted by many who held flags of Israel and came out to show their support. A moving ceremony was held at the “Track 17” Memorial which is part of the Berlin-Grunewald Train Station, from where most of Berlin Jewry was deported to the camps. This was the third time that a delegation of ZDVO members took part in the Berlin Marathon.